With a sandy coastline hugging the Bay of Biscay’s north-west shore, the Charente region is a popular destination for holiday-makers keen to combine the best of beach and rural inland scenery in their break. Renowned for its mild and sunny climate, this region is also famous for oysters and cognac and can boast some beautiful beaches between the historic port of La Rochelle in the north and modern Royan at the mouth of the mighty Gironde river to the south. 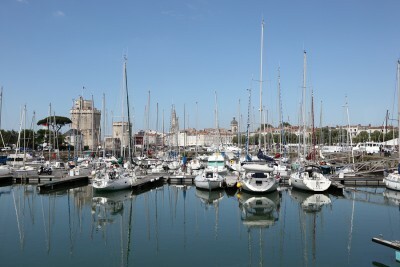 Offshore lies Oloron, France’s second largest island, accessible by road bridge and a fascinating place to visit; its smaller sister, the attractive Ile de Re, lies just a few kilometres further up the coast. On the mainland, the low-lying, marshy ‘Green Venice’ of the Marais Poitevin regional park reveals its watery secrets to visitors. Best explored by boat, this is the country’s second largest expanse of wetland habitat. Not far from here, Poitiers, capital of the historic Poitou region, offers a mix of attractions both old and new – from Romanesque churches to its Futuroscope theme park, built to boost the rural local economy in the 1980s. Other historic towns and villages include Angouleme, Aubeterre sur Dronne, Cognac, La Rochelle, Niort, Rochefort and Saintes – famed for its Roman remains. This is a gentle landscape; while it cannot claim any outstanding natural features the region prides itself on its ‘green’ tourism and accessible countryside with ample opportunities for fishing, walking, cycling and bird-watching as well as other leisurely pursuits. Motorways have opened up this increasingly popular region to the English holiday-maker and, lying just south of the Vendee, it lies within a day’s striking distance of Channel ports.